I was watching a BtS on PS/SS the other day and I noticed some scenes had never been seen being shot. I wonder how many other 'deleted scenes' haven't been on the DVD. Edit: If you are wondering where I found these, they are downloadable here and here, as stated in post 3 and 10. Vernon: What are you going to say for yourself? Harry: I swear I don’t know how it happened! One minute the glass was there and then it was gone. It was like magic. Vernon: There’s no such thing as magic. Next is before the troll's appearance. Maybe they thought the general public wouldn't get the joke. Harry: It’s going into the girl’s bathroom. Ron: Urgh. Smells like Fred’s socks. Could be worse. Next I noticed they referenced Peeves. Whenever I here this scene, I think it faintly hears like 'Peeves playing jokes.' Maybe Rupert stuffed up his delivery on a take, and when they decided to remove Peeves, they used that take. Probably Peeves People playing a joke. jokes. And then the scene which now links to DH. Dumbledore: I don’t need a cloak to be invisible Harry. Let me give you a clue. The happiest man on earth would look into the mirror and see only himself exactly as he is. Dumbledore: It does not do to dwell on dreams and forget to live. Harry: Can I ask you something Professor? Harry: What do you see when you look in the mirror. Sadly, the BtS Part ended there, so I couldn't hear the rest, though I'm positive of what it would have been. Hermione: That’s what’s Fluffy’s guarding on the third floor, that’s what’s under the trapdoor, the Sorcerer’s Stone. OK. Where WERE these deleted scenes? I've never seen them before. I mean we had, what, 9 on the DVD? All we got was 'I want a dragon' and get rid of these letters in the food poccesser. Last edited by ArryGrotter; September 3rd, 2010 at 4:43 am. soooooo how do WE view those scenes? is it possible on our hp dvds? There aren't too many BTS and deleted scenes in PS and COS DVD. where did you see those scenes? I wonder if there's a deleted scene from PS in which Ron and Hermione are talking, when Harry comes out of the Hospital Wing, i mean to hear what they're saying. Does anybody remember seeing this scene? I found it in a DVD magazine, when the dvd first came out. But can't remember if it's ever been seen. I love watching deleted scenes. Yeah. Can you tell us which bts you saw it on! Was it on the dvd bts or internet bts? If on the internet give me a link. If on dvd tell me how to get there. Those lines are in the script. No one knows if they were shot. I've just edited the post with this info. here and here are the sites which I downlaod the BtS, and found these scenes being shot. What scene could that be adapting? Potions? (We can see Ron, so we can rule out the 7 potions riddle.) (Also it seems to light for Potions) But what is that thing in front of Harry? Trophy case from the looks of it. But once again it looks to light to be the Midnight duel?And why would they even shot that scene when they bothered with the moving staircases? After the fluffy scene, they go to bed, and it's dark outside, even though seconds before, it was bright and sunny, not even sunset. I think they look at the hourglasses where the house points are displayed. Probably after McGonagall has taken 150 points from the trio. Yes it looks like Harry and Ron are looking at the hourglasses, i've always wondered where this scene would fit, and why they made it but it never got to the movie as many other scenes. Where did you see the POA script? Sorry, I know Random Slytherin should be answering, but I know where it is. The PoA script is here. It is a draft, not the final. The only other script avaible on the net is CoS. It is the possibly the last draft by the look of it. And this could have explained things clearer! Last edited by ArryGrotter; September 14th, 2007 at 9:40 pm. Jamie Waylett (Crabbe) mentioned in a recent interview that a Dracula/bikini scene had been filmed during the Defense Against the Dark Arts class. Ron blames Crookshanks for the disappearance of Scabbers. Harry says he doesn't care about Ron's rat or Hermione's cat. Ron retorts that a person could die being Harry's friend. I'm starting to get annoyed at how much we aren't shown. 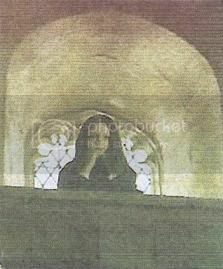 I've been doing some research in my HP stuff and i've found this pic, i know it's not very clear, but the one in it is Ginny in COS movie, and she seems to be in the common room looking down from the balcony between the boys and girls dormitories, i've never been able to know where it fits. If i find any more pics i'll post them.